The smartphone-powered augmented reality experience brings an all-new Star Wars™ experience right into your home. Start the app, put on the headset, and begin your journey with three epic experiences. Wield a lightsaber and face-off against some of the galaxy’s greatest villains, train yourself in strategic combat against invading forces, and master the strategy of intergalactic Holochess. Perfect your lightsaber skills by taking on some of the most menacing villains in the galaxy like Kylo Ren and Darth Vader. Strategic CombatLead Rebel forces against the Empire in large scale ground wars. Command an army as you build out your outposts to withstand the forces of the Empire. Jedi Challenges is currently compatible with the most popular Android and iOS smartphones on the market. Additional smartphones will be compatible soon. Installation is simple. Download the app on the Google Play or Apple store. 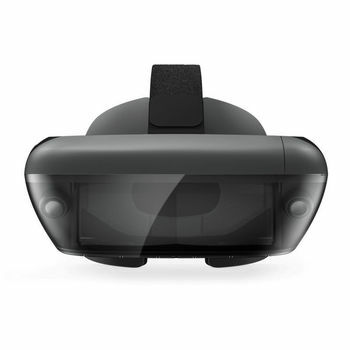 Lenovo Mirage AR headset, Lightsaber controller, tracking beacon, phone tray, lightning to micro-USB cable, USB-C to micro-USB cable, micro-USB to micro-USB cable, AA battery x2, 5V/1A wall-charger and power cable, quick start guide. The smartphone-powered augmented reality experience brings an all-new Star Wars™ experience right into your home. Start the app, put on the headset, and begin your journey with three epic experiences. Wield a lightsaber and face-off against some of the galaxy’s greatest villains, train yourself in strategic combat against invading forces, and master the strategy of intergalactic Holochess. Three epic experiences: Lightsaber Battle, Holochess, Strategic Combat • Wield the Lightsaber to face-off against enemies• Adjustable and finely crafted Lenovo Mirage AR headset• Two fisheye cameras ensure accurate tracking of location• Smartphones and APP required Icons Strategic combat | Lightsaber battles | Holochess Key Features Lightsaber Battles Perfect your lightsaber skills by taking on some of the most menacing villains in the galaxy like Kylo Ren and Darth Vader. Holochess Outwit your opponents in the ultimate game of concentration and strategy. Direct your holographic alien pieces across the board as you battle for territory on checkered game tables. Strategic CombatLead Rebel forces against the Empire in large scale ground wars. Command an army as you build out your outposts to withstand the forces of the Empire. Lightsaber Controller Experience what it feels like to wield a lightsaber for the first time – to face-off against enemies right in your own living room. Feel your opponents’ attacks with force feedback. Lenovo Mirage AR Headset The Lenovo Mirage AR headset is ergonomically designed for maximum game immersion. Tracking Beacon The beacon ensures accurate tracking of your location, while expanding and filling in the environment around you with an immersive augmented reality universe. Phone Compatibility Jedi Challenges is currently compatible with the most popular Android and iOS smartphones on the market. Additional smartphones will be compatible soon. Installation is simple. Download the app on the Google Play or Apple store. WHATS IN THE BOX Lenovo Mirage AR headset, Lightsaber controller, tracking beacon, phone tray, lightning to micro-USB cable, USB-C to micro-USB cable, micro-USB to micro-USB cable, AA battery x2, 5V/1A wall-charger and power cable, quick start guide. Phones Star Wars™: Jedi Challenges is a smartphone-powered experience compatible with select Android and iOS devices. Currently Validated Phones: iPhone 7 Plus, iPhone 7, iPhone 6s Plus, iPhone 6s, Samsung Galaxy S8, Samsung Galaxy S7 edge, Samsung Galaxy S7, Google Pixel XL, Google Pixel, Moto Z. Additional devices will be validated and added to the above list soon. Check back here for updates.